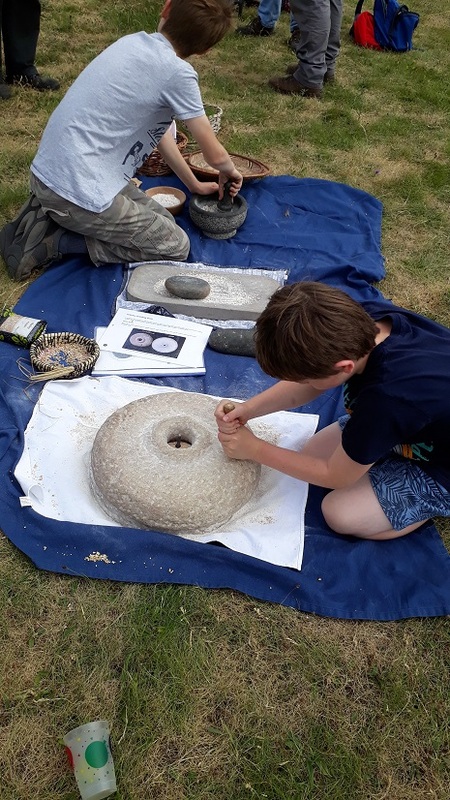 A throng of people of all ages from the local community, visitors, volunteers and archaeologists set off back in time for our dinners yesterday, with an iron age food tasting day at Stoer Green. The fire was lit at about 10am to heat stones while a pit was dug for roasting meat. We put up a tipi just in case the weather wasn’t good, but in the end we didn’t need it and it stayed beautifully dry, breezy and warm for the whole day. All afternoon, food preparation went on, with salad and fruit foraged from local crofts, beans picked, barley stews prepared, drinks brewed and flour ground. Grinding grain with traditional tools was particularly popular among the younger participants. 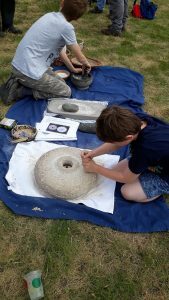 Who knew children could be so willingly put to work with a quern? Another big surprise was the ease with which butter can be churned from cream with the help of a few hazel sticks. The crowd swelled when it came to the eating part of the event at 6pm. Perhaps it was the smell of the oat and barley bannocks baking on hot stones by the fire, or the scent of the dumpling in the hot water tank that brought people out, or maybe it was the chance to sample Dave’s home-brewed Iron Age beer? Either way, it was a big and happy gathering, looking out to the broch from around the fire, which was appropriately enough nestled at the foot of a burnt mound, to which we have added a fair few charred, split stones, as people have been doing for many thousands of years. Huge thanks to everyone who took part, especially those who brought and prepared food. We learned a lot, had masses of fun and will no doubt repeat the experience to try to make it even more authentic and delicious. This is the third Iron Age food event we’ve organised over the past few years, and the first time we’ve cooked everything on a fire outside. Each time we enjoy it more and get better at bringing the old ways of making dinner back to the present. The prize must surely go to Claire, pictured above, for digging roast venison and lamb out of the pit, as if by magic – a bit sandy but cooked to perfection – and chucking a plant-pot into the fire and conjuring a loaf of bread from it. Nigel’s bere-and-beer bannocks and Roz’s oat bannocks were all scrumptious with Lesley’s hazel-battered-butter and honey. Big thanks to Jen for getting our culinary ducks in a row, and for her delicious barley stews (veggie and non-veg), which were perfect with Celtic beans! Thanks to everyone else who helped with the cooking, fire-tending and clearing up. There has been a request for recipes to be posted on here, so watch this space. Meanwhile, the foraged herb salad consisted of leaves of sorrel, mint, fat hen, wood sorrel, violets, dandelions, lady’s mantle, wild garlic, chickweed and ground elder, plus clover flowers, wild strawberries and blaeberries. Yum!